The technology industry brings us a smorgasbord of wonderful stuff that goes on forever. I'm profoundly grateful. But I've never understood its long-standing infatuation with one of its most famous inventions: buzzwords. About 90% of the ones it creates are confusing rather than clarifying, especially since few catch on with the non-geek majority. Cloud computing  the most pervasive buzzword du jour  is particularly pointless. Cloud is a synonym for the Internet, a concept we've all understood reasonably well for 15 or more years. Why rename it now? The fact that I grouse about the terminology doesn't mean I'm skeptical about the idea it describes. Actually, I love the idea of keeping photos, music, video and other files on the Internet. Doing so means I can get to my goodies from my laptop, my smart phone and my iPad, without trying to remember which items I stored where. And having an online backup or two of essential files is a humongous relief if your hard drive goes kerflooey  as so many drives will, sooner or later. Putting your digital possessions in the cloud isn't tough. There are a bunch of sensible ways to do it, each with its own upsides, plus a downside or two. Herewith, a quick guide to four of them. 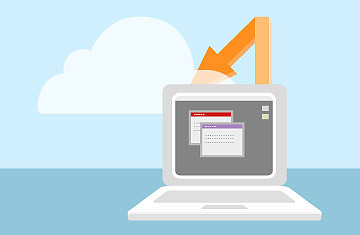 The simplest way to store your stuff in the cloud is to keep saving it on your computer's hard drive, just as you've been doing forever. All you need is a synching service that instantly and silently clones the contents of folders you specify to all your computers as well as to an online drive where everything's available all the time. Box.net and SugarSync will give you 5 GB of space for free, which is more than enough to judge whether their offerings will make your life easier. (Longtime fan favorite Dropbox offers a more parsimonious 2 GB; it also suffered from an unnerving security glitch last month that briefly let anyone log into any account without providing a password.) Besides providing software for Windows PCs and Macs, all these services have apps for iPhones and Android handsets that give you on-the-go access to the files you've synched from one or more computers. The biggest gotcha with synching is that it can get unaffordable fast, especially if you want to shuttle copious amounts of disk-hogging videos as well as relatively slender files such as photos and MP3s. If I wanted to use SugarSync to back up the entire contents of my MacBook Air's solid-state drive, I'd need to spring for the 250-GB plan, which costs $24.99 a month or $249.99 a year. Instead, I'm selective  I make do with the 30-GB version, which is $4.99 a month or $49.99 a year. One other tip: synching services only work if you're running their software on all your computers and it's functioning properly. I've occasionally discovered that such utilities have quietly conked out without me noticing. It pays to check them from time to time to make sure they're moving files back and forth as promised. 2. Use one or more online storage services for little or nothing. With services such as Box, Dropbox and SugarSync, you've got two options: limit your uploads to a few gigabytes and pay nothing, or pay a monthly fee for more space. Or you could ignore them altogether for one or more services that provide more spartan online storage at much lower price tags. Last week, for instance, Amazon.com started allowing anyone who pays for its Cloud Drive service to upload an unlimited quantity of music. There are some catches, but for $20 a year you can store all your MP3s on the Web, plus another 20 GB of files of any type  a good, budget-minded alternative to a synching service. Read about the promise and pitfalls of cloud computing.